I was born in the USSR in the decade after the Holocaust, shortly after the death of Stalin. By then, there was no day- to-day fear for the Jews of being killed or sent to death camps. By then, the fear was of being persecuted simply for practicing Judaism. Nevertheless, largely through my grandfather’s efforts, we got a Jewish education, and we stayed loyal to Torah. In 1971, we had the opportunity to get out, and we took it. We came to Israel, where we had relatives, and settled in Kiryat Malachi. I had just finished high school in Russia, and now I enrolled in a language school to learn Hebrew, with the intent of continuing on to university. At this time, many people were telling my father that his daughter should not be going to the university — that it was not right, not proper, for a religious girl to do this. My father was conflicted and didn’t know how to guide me. Meanwhile, I was determined to get a university education and had enrolled in a preparatory course. But also, I didn’t want to hurt my father or go against him. So, when the opportunity came to visit New York and see the Rebbe – who, I knew, had studied in universities in Paris and Berlin – I seized the chance. I was sure the Rebbe would understand me and also help me put my father’s mind at rest. In advance of the audience, I wrote a long letter to the Rebbe in Russian, explaining my situation and pouring out my heart. And when I walked into the Rebbe’s office, my letter was lying on the table in front of him. This I remember vividly. aristocratic families. No one speaks like this anymore. He said, “The university in the modern Western World is not anything like the university was in Europe before World War Two. Back then, the university placed a great deal of value on pure study. would serve me well in the future. His words had a big impact on me. Rather than enrolling in university to study psychology, I took his advice and I enrolled in the girls’ seminary in Kfar Chabad. I studied to be a teacher and received a teacher’s certificate. This teacher’s certificate proved to be a most valuable thing later on because, when the Rebbe’s prophecy came true and hundreds of thousands of Russian Jews streamed into Israel, I was able to help them. The Rebbe then instructed me to work for an organization called SHAMIR (Association of Religious Professionals from the USSR), which was set up to help Russian immigrants spiritually as well as physically by helping them settle in Israel. Years later I got a job as a teacher in a language school, where I taught Hebrew to Russian immigrants. Thanks to the key to success I received from the Rebbe, I was able to help them. that I was able to help. 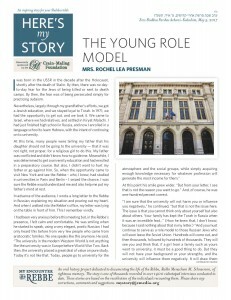 Mrs. Rochel Leah Presman, a mother of eight, gives Torah classes in Russian and is a teacher at Ulpan Morasha in Jerusalem where she was interviewed in February of 2017. At this point his smile grew wider. “But from your letter, I see that is not the reason you want to go.” And, of course, he was one-hundred percent correct.